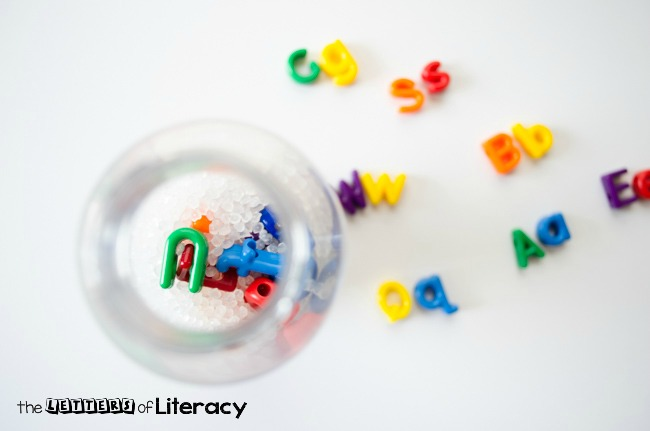 Learning the alphabet is a challenge, but it doesn’t have to be boring! 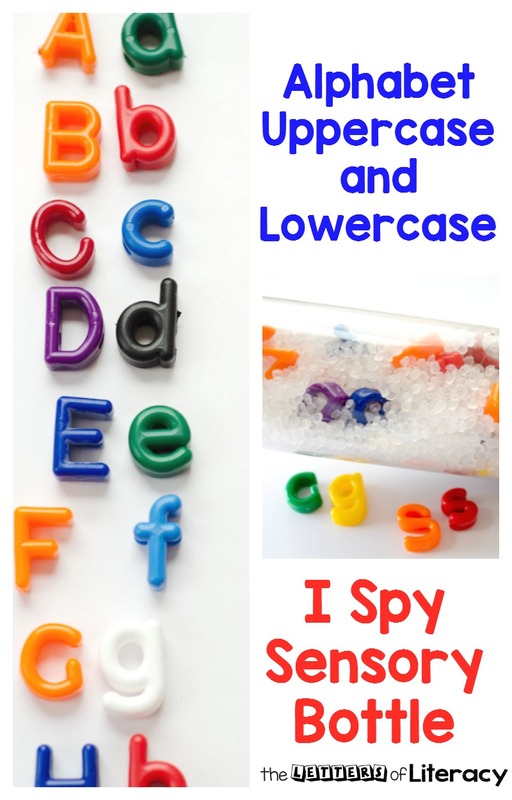 This alphabet uppercase and lowercase I Spy sensory bottle is a fun and educational way to help children get excited about matching the letters of the alphabet. Matching uppercase to lowercase letters of the alphabet is a complex skill! 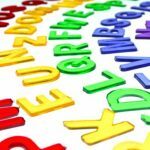 While a child will easily be able to identify and match ‘S’ to ‘s’, there are some extra tricky combinations. My preschool students always had the most trouble with the letters ‘b’, ‘p’, ‘d’, and ‘q’. It’s completely understandable since it is the same shape, just rotated differently. That requires visual discrimination skills that will come through time, practice, and patience. 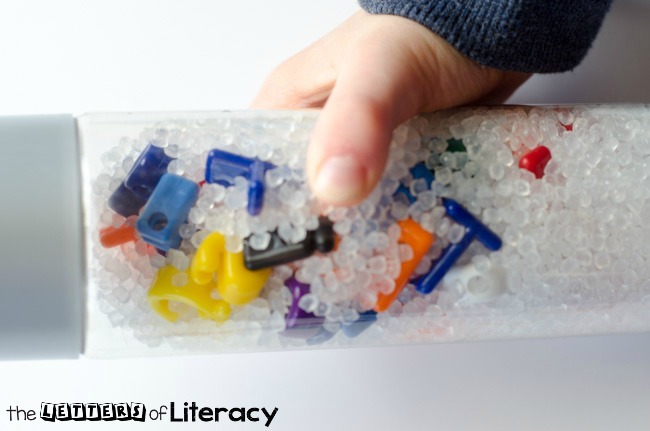 This sensory bottle is a great tool to help children gain more confidence in identifying their letters, and it has endless possibilities for play! The water bottle used here is a VOSS water bottle. It can be tricky to find. 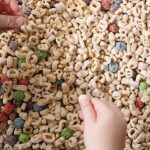 Check places such as Target, Kroger, Whole Foods, or Walmart. Amazon carries them as well for an easy solution! Any clean water bottle will work though. 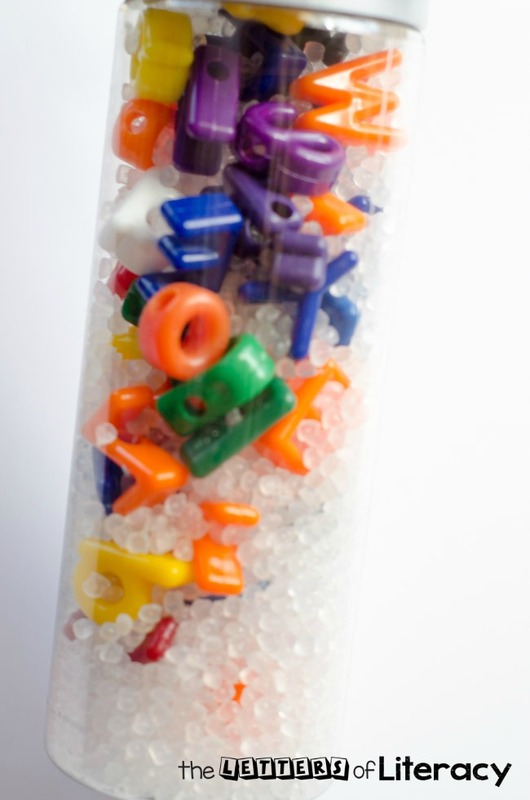 Letter beads or alphabet beads can be found at Amazon or some school supply stores. They are actually lacing beads but have so many uses. 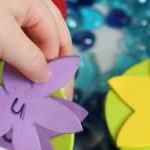 We use ours constantly for making word families, practicing beginning sounds, lacing our names, and more. Each box of beads contains multiple sets of each letter, so they are perfect for classroom use. The only downside is uppercase and lowercase letters are sold separately and not as a set. Poly-pellets are available at most craft stores. These are what you would find in many bean bags. Amazon carries them as well. You could even substitute rice. Lastly, super glue is great to keep everything in the bottle. My favorite kind is Gorilla Glue. Poly-pellets shooting across the floor are never fun! Before we made our bottle, my five-year-old and seven-year-old matched all of our alphabet beads. Next, we poured the poly-pellets through the funnel. We filled our bottle about half way up with the poly-pellets. Then we added all of the uppercase and lowercase letters. Shake the bottle and add any more poly-pellets until you get your sensory bottle just the way you want it. 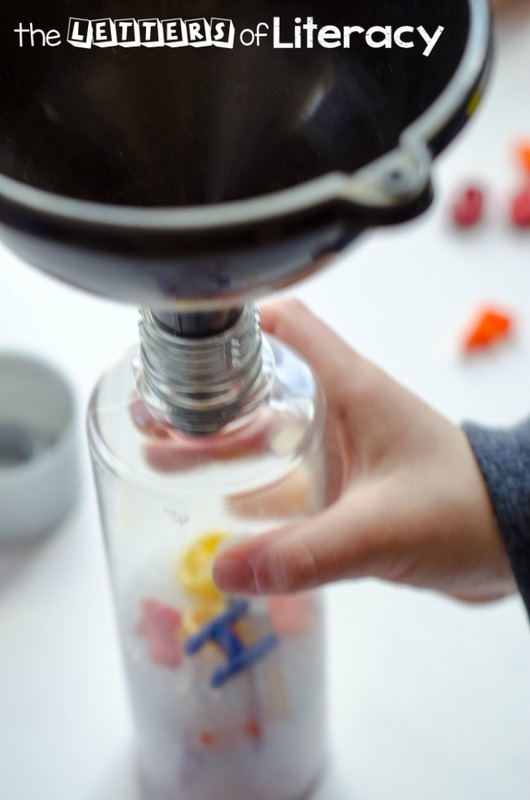 We just love the way the poly-pellets tap in the bottle. It makes it sound like a rainstick! Lastly, glue on the lid. The glue will need to be reapplied every few months, so check your bottle regularly. 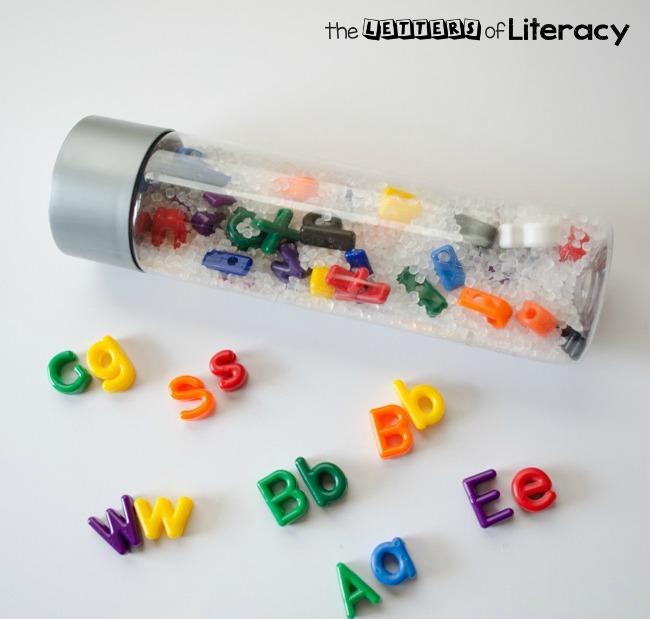 Now you are ready to enjoy a fun and exciting sensory bottle while exploring the alphabet at the same time. 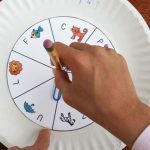 It would be great for a circle time activity, in small groups, and even for individual play. 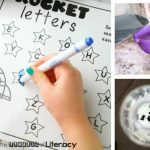 Children will love pointing out the letters they know and rolling it around the find its match! 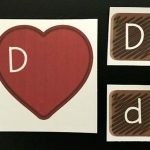 Looking for more uppercase and lowercase letter matching activities? 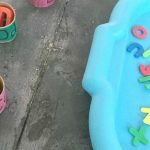 Play in a letter matching pond sensory bin, or grab a printable ice cream alphabet match game! 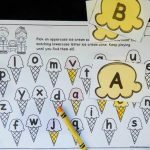 For quick prep alphabet practice, grab our pack of alphabet printables!